Can't get enough Peonies? 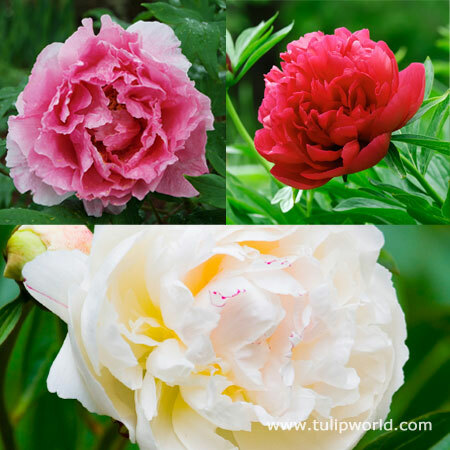 Try the mixed Peonies where you will have gorgeous ruffled blooms of Pink, Red, and White. These easy-to-grow Perennials bloom in the Early Summer and will leave you with shrub-like foliage to last until frost. Plant as a border in a sunny area. Tip: Peonies make great cut flowers, so you can enjoy them indoors as well! I have planted my Peonies as per instructions. So far, 1 of the roots are showing great progress, the other 2 are being slow, but are growing. Only been in soil about 2 weeks, but I'm hopeful.